note2: in order to increase antenna sencitive, RF parts change to 0201. 802.11n, 2T2R, speed up to 300Mbps. One U.FL slot, one on board antenna. 1 port/5 ports, up to 100Mbps. Support USB 2.0, up to 480MBit/s. 74mA wifi standby, 230mA wifi full speed, 5V input. note: normally, we upgrade or fix brick are using Firmware. Flash Image is a clone of the full flash, for professional usage only. VoCore2 + Dock Ultimate version makes it easy to use. VoCore Camera Tiny camera supports h264 + microphone. VoCore2 is a successor of VoCore, make it more fast, stable, but still same size. 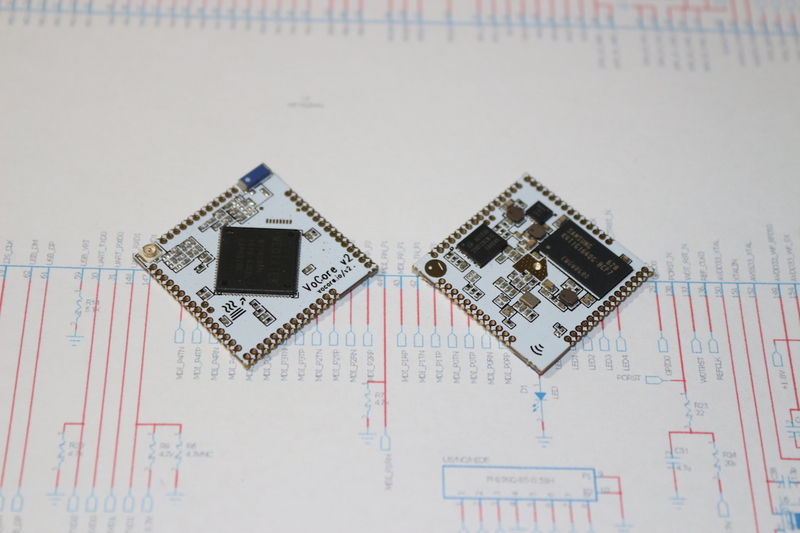 * five ethernet port mode, sdcard mux to i2s/i2c. * hole diameter is 0.6mm. 1. connect to 3.6V~6.0V and GND with a stable power source, such as USB charger. note: be careful, high voltage will damage your VoCore. 2. if everything works, after 30 seconds, you will find VoCore2 in your computer hotspot list. 3. connect to VoCore2 hotspot. 4.a using ssh or putty or similar tools login to VoCore2(root/vocore). 4.b using USB2TTL, please check "Connect to VoCore through USB2TTL" section. 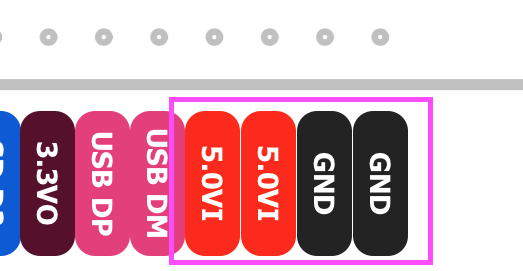 1. connect USB2TTL.TXD to VoCore2.RXD2, USB2TTL.RXD to VoCore2.TXD2, USB2TTL.GND to VoCore2.GND. 2. setup your serial application(such as putty/teraterm for windows, kermit for mac,linux) in your computer to 115200bps, 8 data bits, no even, 1 stop bit. 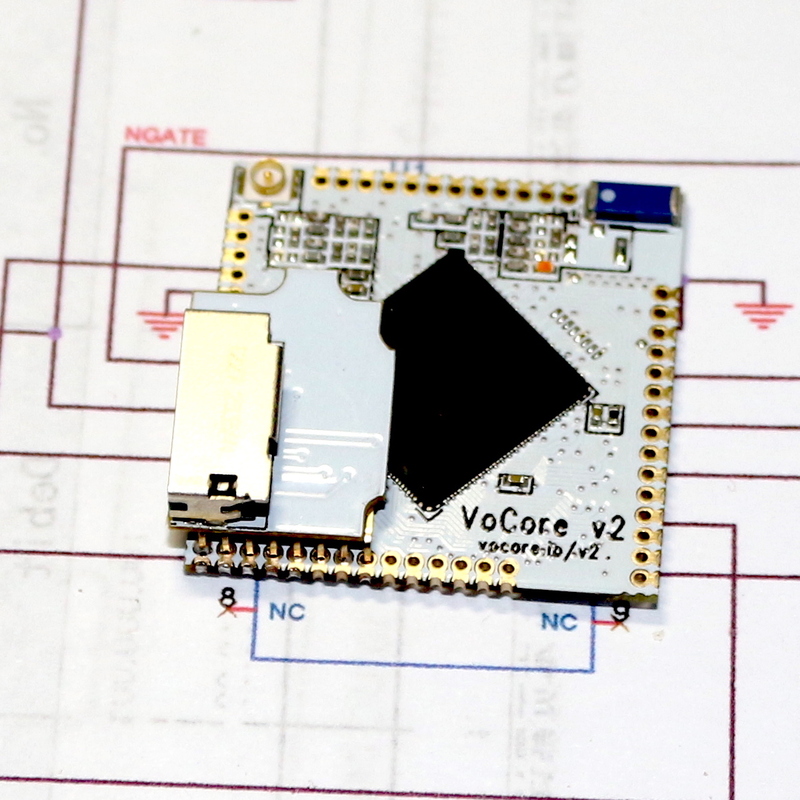 3. power on your VoCore2, now you should find some text output. This is for firmware 20190316 or later which based on openwrt 18.06.2. This is for ßfirmware 20170527 which based on openwrt cc. note: please upgrade your firmware to 20190127, this version is out of date. 1. connect to your VoCore through USB2TTL. 2. run command in console(UART console). 3. setup network to enable dhcp(get ip from your hotspot). 4. setup firewall to enable access to internet through your hotspot. 5. setup wireless to enable ap+sta mode. uci set wireless.sta.ssid="[TARGET AP SSID]"
uci set wireless.sta.key="[TARGET AP PASSWORD]"
note:replace [TARGET AP SSID] to the target ap ssid you want to connect to, [TARGET AP PASSWORD] is its password. 5. restart your network, it will work. 6. (option) once ap+sta is totally up, disable it in config, so if next time your target ap is missing, you still able to connect to VoCore2. 1. download the latest firmware(not the flash image) in this page Download section. 2. connect to your VoCore hotspot, open browser view 192.168.1.1 or 192.168.61.1. 3. LuCI console using username: root, password: vocore, click on "Login" (picture part 1). 4. select "System" -> "Backup/Flash Firmware" (picture part 2). 5. click on "Choose File", choose your downloaded firmware(again, not the flash image, picture part 3), then click "Flash Image". 7. if everything ok, press "Process". 8. normally it will take 2~3 minutes, please wait until it is ready. note: if power cut off during the upgrade process, your VoCore2 will brick, check "Fix Bricked VoCore2"
1. install Ubuntu 14.04 64bit Server to Virtual Machine. 4. call "make menuconfig" in the openwrt folder, configure openwrt in menu, choose MT7688/28/VoCore2 in menu. 1. compile openwrt for VoCore2, it will create toolchain or download it at Downloads/Toolchain(for Ubuntu 14.04 64bit). 2. make a simple code in C, compile it in command line. 1. upload firmware through luci, please read "Upgrade Firmware" section. 2. upload firmware through console, connected to VoCore hotspot. here is two choices, 2.a will erase all data/config you write to VoCore, 2.b just upgrade the firmware but keep them. (3) wait until mtd done, reboot your VoCore. note: if you want set your VoCore back to first time boot up, call "firstboot" in console. 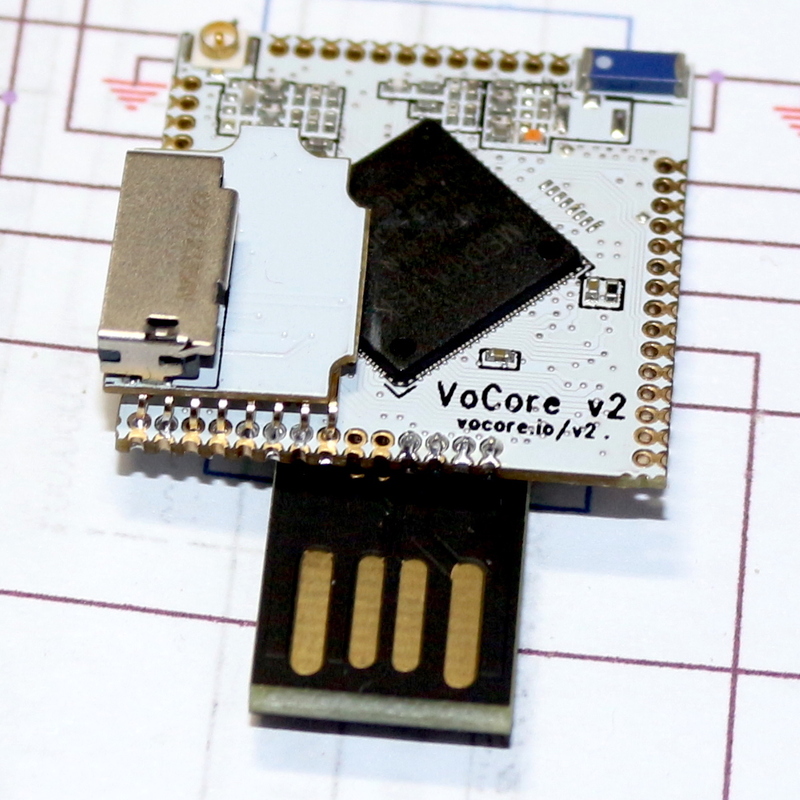 1. connect your VoCore2 to computer through USB2TTL(UART2 RXD2+TXD2+GND). 2. open tty tools(must have kermit protocol), such as kermit, ckermit, teraterm. 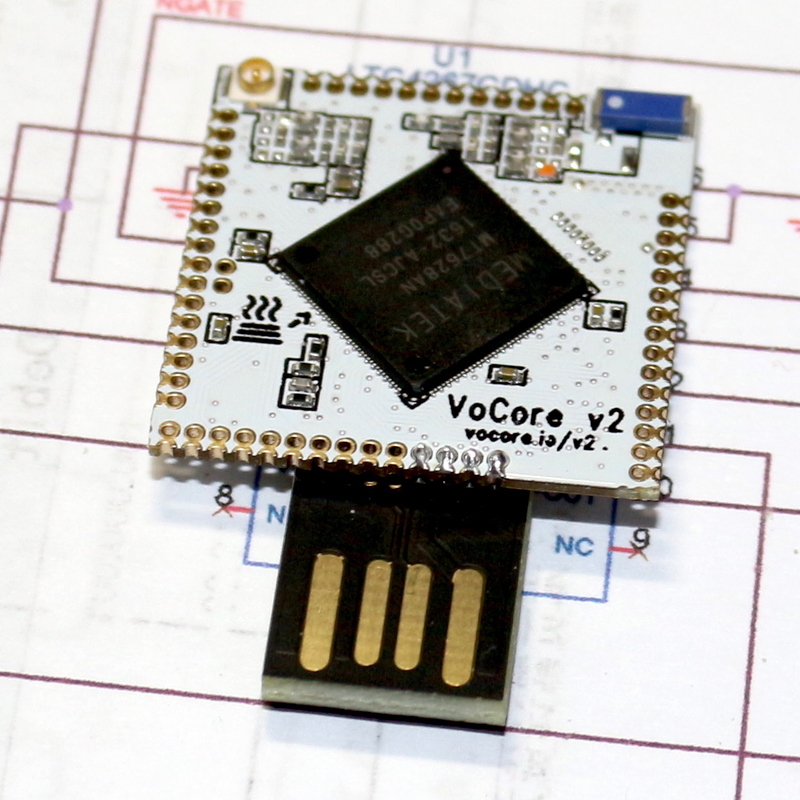 3. power up your VoCore, once you find: "0: Load system code then write to Flash via SERIAL. ", press '0'. note: VoCore will show "## Ready for binary (kermit) download to 0x80100000 at 115200 bps..."
note: kermit: press Ctrl and '\' same time then press 'c', you will switch to kermit command console. 5. send upgrade firmware to VoCore, after that, back to VoCore uboot console. note: kermit: call "send path/to/your/upgrade/file/on/pc.bin" to send firmware, around 10 minutes, once it finished, call 'c' back to console. 6. wait around 20~30 seconds, firmware uploaded, your VoCore will reboot. 1. You must have another VoCore/VoCore2 or one flash loader and six wires. 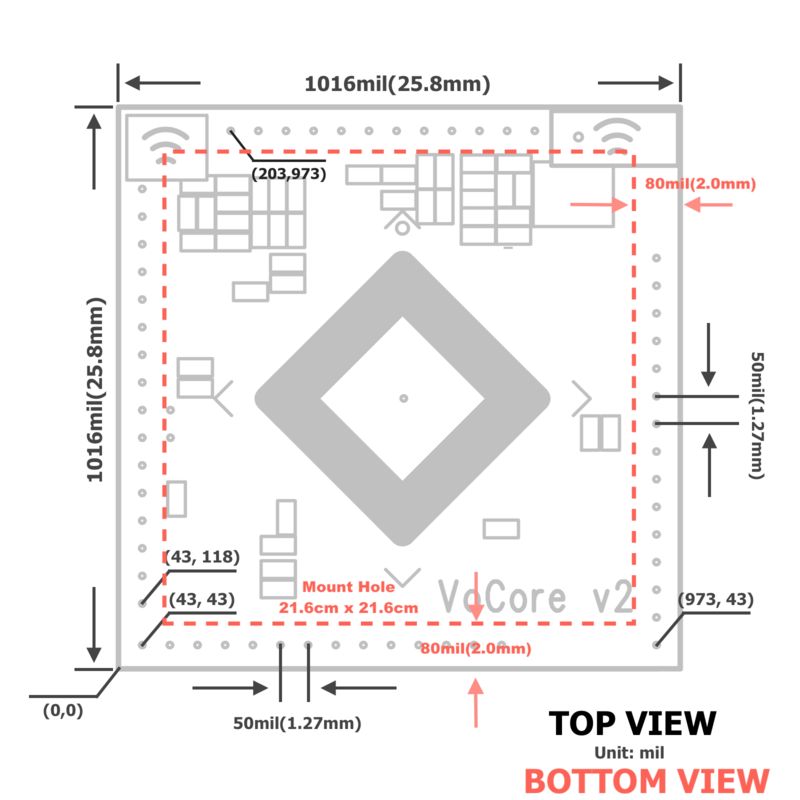 2.1 using another VoCore/VoCore2 to recover your bricked VoCore2. 2.2 using flash loader to recover your bricked VoCore2. note: if not work, swap MISO/MOSI. 2.2.j now, download then send "Flash Image" to VoCore2.2. 2.2.k remove wires, connect VoCore2 back to power, everything should back normal. 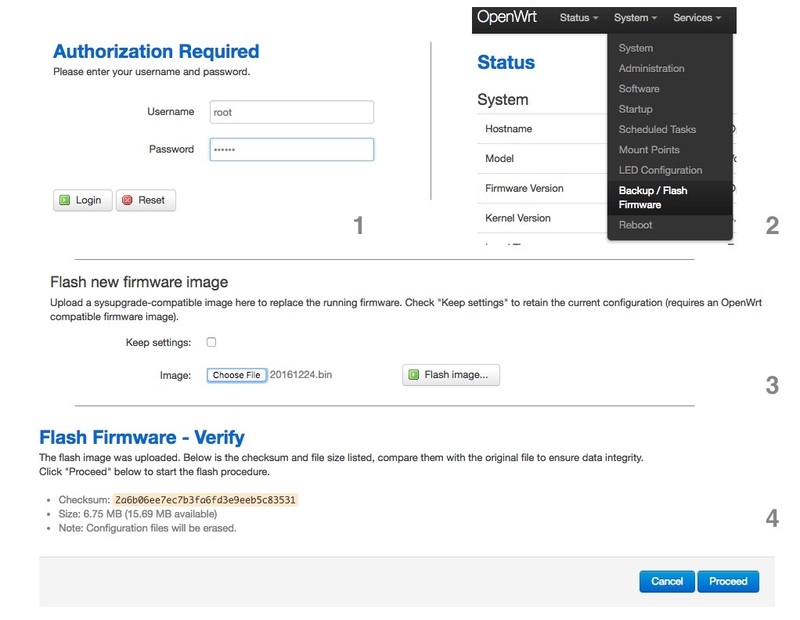 3. option: better to upgrade your firmware after recover, Flash Image is out of date. On VoCore2 standard version we have another antenna, default it is power off status(to avoid two antenna cross-talk to each other), if you have a external U.FL antenna, you can connect it to VoCore2, convert it from a portable router to a full function 802.11n router, maxmize its speed and signal strength. 1. download a factory setting read/write tool to /tmp/ on VoCore, chmod +x /tmp/ant*. 2. we run the following script to enable second antenna. 3. call firstboot -y(all your setting will lost! ), then reboot. 1. get into VoCore console, by ehternet or serial port(TTL). 2. copy mt7628.sh to your VoCore2 /tmp, or directly copy the txt in the script and run in console. 3. run mt7628.sh by "sh /tmp/mt7628.sh", then reboot. note: your mac address will be fixed to b8:d8:12:67:01:73, you can change this to modify your VoCore2 mac address. 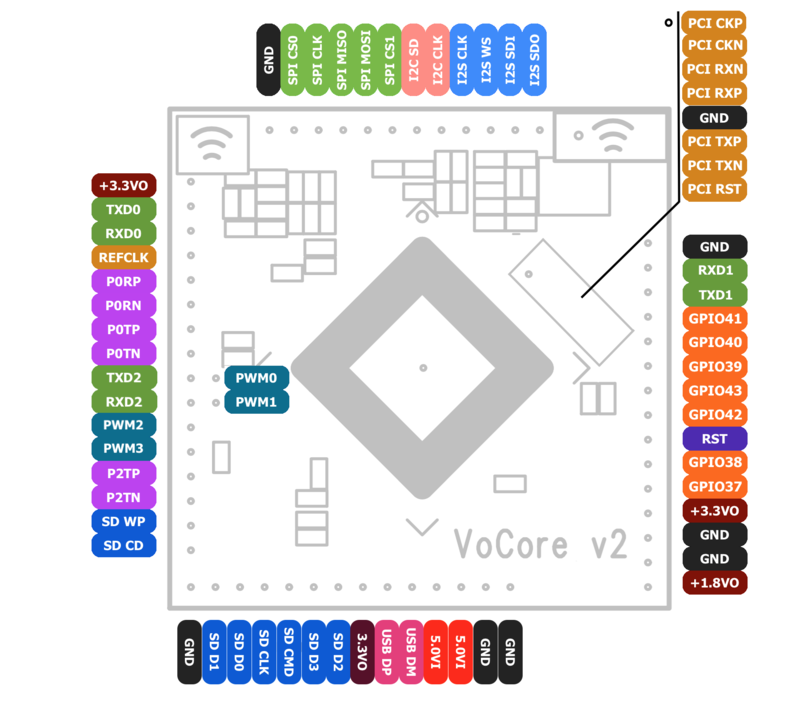 1. reboot vocore2 at serial console, check "Connect to VoCore through USB2TTL"
2. once reboot, it will show "7: Load Boot Loader code then write to Flash via Serial. ", now we are ready to send the data. 3. use kermit or compatible tools send uboot.bin, uboot.bin can be get from from Download section. 4. wait until it reboot. We made a simple tool for this, download here, its name is "mem", put the executable file into /bin/ in VoCore2. 1. on customized PCB, suggest keeping 16mm x 16mm rectangle clearance(no copper) for better signal on board antenna. 2. suggest using hot air instead of iron, DDR2 is a ESD sencetive part, might cause permanent damage. 3. must use middle level temprature paste(180C, Sn-Bi-Ag) or lower one, VoCore2 is using high-temprature paste(220C, Sn-Cu-Ag), same temprature level might cause damage to VoCore.